Oncor Electric Delivery Company LLC (Oncor) is one of the largest transmission and distribution (T&D) network providers in Texas. It is a majority-owned subsidiary of Oncor Holdings (with an 80.25 per cent equity share) and was recently acquired by Sempra Energy. Texas Transmission owns the remaining 19.75 per cent share. Oncor is a member of the Electric Reliability Council of Texas (ERCOT) and delivers electricity to more than 3.5 million homes and businesses through its 134,000-mile (215,740-km) T&D network. It provides transmission services to electricity distribution companies, cooperatives and municipalities, and distribution services to Retail Electric Providers (REPs), which sell electricity to retail customers. Currently, Oncor is investing in expanding its network and operations in Texas. Under this, in November 2017, it exchanged its 345 kV transmission network for certain T&D assets of Sharyland Entities to expand its customer base in west Texas. Oncor is also working on various transmission projects to maintain the reliability and stability of its power network. Oncor’s T&D assets are located principally in the north-central, eastern and western parts of Texas, covering about 40 per cent of the state’s population, 99 counties and more than 400 incorporated municipalities. As of December 31, 2017, Oncor’s transmission facilities included 5,925 circuit miles (9,539 circuit km) of 345 kV transmission lines and 9,994 circuit miles (16,090 circuit km) of 69 kV to 138 kV transmission lines. About 79 generation facilities adding up to 36,819 MW were directly connected to Oncor’s transmission system, along with 301 transmission stations and 730 distribution substations. In November 2017, Oncor exchanged approximately USD383 million worth of its transmission assets, consisting of 517 circuit miles (832 circuit km) of 345 kV transmission lines, and approximately USD25 million in cash for approximately USD408 million worth of Sharyland Entities’ distribution assets (constituting most of its electricity distribution business) and part of its transmission assets. The transaction expanded Oncor’s customer base in west Texas and provides potential growth opportunities for its distribution network. Note: 1-During 2017, Oncor sold 832.37 circuit km of its 345 kV transmission network to Sharyland Entities. The majority of its distribution system operates at the 25 kV and 12.5 kV voltage levels and included over 3.5 million delivery points as of December 31, 2017. Oncor’s distribution system (excluding assets acquired in the Sharyland Asset Exchange) consists of 57,454 miles (92,501 km) of overhead primary conductors, 21,162 miles (34,071 km) of overhead secondary and street light conductors, 17,728 miles (28,542 km) of underground primary conductors and 10,931 miles (17,599 km) of underground secondary and street light conductors. In addition to the above, the Sharyland Asset Exchange added approximately 12,000 miles (19,320 km) of distribution lines to its system. During the course of the bankruptcy proceedings of Energy Future Holdings (EFH), the previous owner of Oncor Holdings, certain reorganisation plans were filed with the Public Utilities Commission of Texas (PUCT), which contemplated the transfer of its indirect ownership interests in Oncor. After a few failed attempts to sell Oncor, EFH managed to enter into a merger agreement in the latter half of 2017 with the San Diego-based energy services holding company Sempra Energy. With all the required approvals from the US Bankruptcy Court for the District of Delaware in hand by February 26, 2018 and from PUCT by March 8, 2018, Sempra Energy completed the USD9.45 billion acquisition of EFH on March 9, 2018, including its indirect ownership interest in Oncor. The close of the transaction created a utility holding company with one of the largest customer bases in the American electric power industry. In order to maintain its financial and operational performance, Oncor has been implementing various ring-fencing measures to operate independently from its owner and to mitigate risk in the event of a bankruptcy or other adverse financial development of its owner. Oncor had designed various legal and financial ring-fencing measures with EFH. It has outlined certain similar measures with Sempra Energy as well, including governance mechanisms and restrictions. These measures limit Sempra’s ability to direct Oncor’ management, policies and operations, including the deployment or disposition of its assets, declarations of dividends, strategic planning and other important corporate issues and actions. These limitations include Sempra’s limited representation on Oncor’s Board of Directors. Oncor has so far managed to maintain its operational performance irrespective of the recent events including change in ownership. 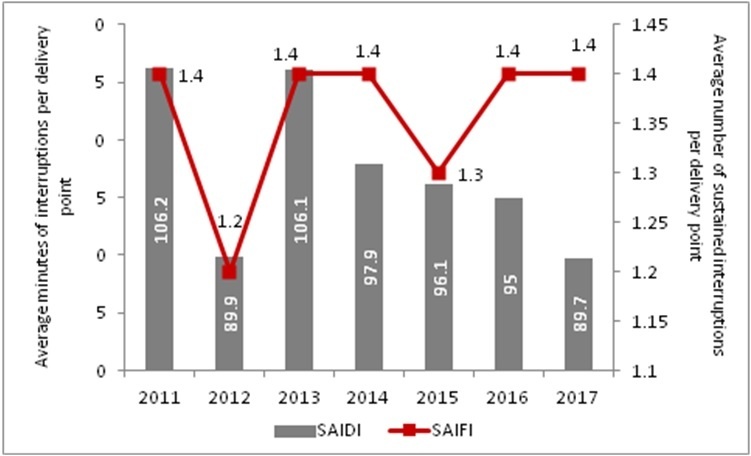 During 2011–17, the System Average Interruption Duration Index (SAIDI) reduced by 16 per cent whereas System Average Interruption Frequency Index (SAIFI) remained stagnant at 1.4. During 2011-17, Oncor’s revenue increased at a compound annual growth rate (CAGR) of 4.06 per cent, from USD3,118 million to USD3,958 million. The revenue from transmission services grew at a CAGR of 9.18 per cent from USD555 million in 2011 to USD940 million in 2017. The net profit of the company also rose from USD367 million in 2011 to USD419 million in 2017, registering a CAGR of more than 2 per cent during the period. The company mainly earns from offering T&D services based on the tariffs approved by PUCT and the Federal Energy Regulatory Commission (FERC). The Public Utility Regulatory Act (PURA) of Texas allows Oncor to update its transmission rates periodically to reflect changes in invested capital. This ‘capital tracker’ provision encourages investment in the transmission system by allowing timely recovery of and return on new investments. This is reflected in the rising transmission capital expenditure of the company, which increased at a CAGR of 3 per cent during 2011-17. Other sources of revenue for Oncor through its transmission business include offering services such as system impact studies, facilities studies, maintenance services of transformer equipment, substations and transmission lines, etc., to third parties. Oncor’s Board of Directors, which annually approves capital expenditure estimates, has approved a capital expenditure programme of USD1.8 billion for 2018 for the expansion of the company’s T&D network. The management currently expects to recommend USD1.7 billion in annual capital expenditure for the period 2019 to 2022 to the Board of Directors. Oncor is currently working on various transmission projects. The biggest one is the Odessa–Moss–Riverton–Sand Lake Project, which is part of the Far West Texas Project, which the company is developing along with American Electric Power (AEP) to address continued load growth in the southwest of Odessa, Texas. The Far West Texas Project plans to connect Odessa, Moss, Permian Basin, Mason, Pecos, Barrilla, Fort Stockton, Rio Pecos and Bakersfield in Texas. As per the proposal, the Odessa–Moss–Riverton–Sand Lake transmission line will be constructed by Oncor, and the Sand Lake–Solstice–Fort Stockton Plant–Lynx–Bakersfield line will be built by AEP. In addition, three 345/138 kV transformers will be added in the Riverton, Solstice and Lynx substations. The Odessa–Moss–Riverton–Sand Lake transmission line project consists of two 345 kV lines. One will run from Oncor's Riverton switching station, now under construction in Reeves County, to the existing Odessa extra high voltage (EHV) switching station in the city of Odessa in Ector County. The other line will run from Riverton to the existing Moss switching station, also in Ector County. Depending on the specific route selected, the project will run roughly 110 to 133 miles (177 to 214 km) with cost estimates ranging from USD217 million to USD227 million. ERCOT approved the project in June 2017. In March 2018, Oncor filed its application for the certificate of public convenience and necessity (CPCN) with PUCT for the project. The project is proposed to be in service by 2022. As a T&D electric utility in Texas, Oncor operates a low risk, regulated business in a supportive regulatory environment, with a stable financial profile. With recent changes in ownership, Oncor will benefit as a subsidiary of the stable and financially strong Sempra Energy, following the elimination of the large parent debt at the bankrupt EFH. These developments, along with Oncor’s efforts to continue operating as an independent entity to reduce its risks, provide a positive outlook for the company in its T&D operations.